Η CASIO είναι μια πολύ γνωστή εταιρία που από αρκετές δεκαετίες κατασκευάζει ρολόγια από φθηνά μέχρι αρκετά ακριβά. Από δική μας μακρόχρονη εμπειρία έχουμε διαπιστώσει ότι όλα της τα προϊόντα είναι πολύ καλής ποιότητας και λειτουργούν άψογα για πολλά χρόνια μέχρι που τα βαριόμαστε και τα παροπλίζουμε σε κάνα συρτάρι αντικαθιστώντας τα με νεότερα μοντέλα χωρίς να υπάρχει ιδιαίτερος λόγος ! Τον τελευταίο καιρό άρχισε να κατασκευάζει και διάφορες άλλες εξίσου καλής ποιότητας ηλεκτρονικές συσκευές όπως ψηφιακές φωτογραφικές μηχανές, υπολογιστές χειρός, ρολόι χειρός με ενσωματωμένη ψηφιακή φωτογραφική μηχανή, ρολόι χειρός με ενσωματωμένο MP3 Audio player, ρολόι χειρός με ενσωματωμένη ατζέντα και πολλά άλλα που θα μπορείτε να δείτε σε άλλες σελίδες του site μας www.galaxy.gr. Μεταξύ των τελευταίων επιτευγμάτων της CASIO είναι και το πολύ όμορφο ρολόι χειρός με ενσωματωμένο GPS πολλών δυνατοτήτων που παρουσιάζουμε εδώ και μπορούμε να σας προμηθεύσουμε ! Όμορφο και εντυπωσιακό το αδιάβροχο ρόλοι χεριού που μπορεί να φοριέται συνεχώς. Φαντασθείτε την αξία του σε περίπτωση ναυαγίου ή ατυχήματος σε συνδυασμό με κινητό τηλέφωνο ή φορητό ασύρματο σε αδιάβροχη θήκη ! Τηλεφωνήστε και σε λίγες ώρες θα το έχετε στο χέρι ! ΤΟ ΡΟΛΟΪ ΧΕΙΡΟΣ CASIO PRT-2GP ΜΕ ΕΝΣΩΜΑΤΩΜΕΝΟ GPS ΠΕΡΙΛΑΜΒΑΝΕΙ ΣΤΗ ΣΥΣΚΕΥΑΣΙΑ ΤΟΥ ΟΛΑ ΤΑ ΠΑΡΕΛΚΟΜΕΝΑ ΚΑΙ ΕΤΣΙ ΔΕΝ ΘΑ ΧΡΕΙΑΣΤΕΙ ΑΡΓΟΤΕΡΑ ΝΑ ΠΛΗΡΩΣΕΤΕ ΕΠΙ ΠΛΕΟΝ ΧΡΗΜΑΤΑ. - ΤΟ ΑΔΙΑΒΡΟΧΟ ΜΕΧΡΙ 50m ΒΑΘΟΣ ΡΟΛΟΪ GPS PRT-2GP ΠΟΥ ΦΟΡΙΕΤΑΙ ΣΤΟ ΧΕΡΙ. - ΤΗΝ ΒΑΣΗ INTERFACE ΣΤΗΝ ΟΠΟΙΑ ΤΟΠΟΘΕΤΕΙΤΑΙ ΤΟ ΡΟΛΟΪ ΓΙΑ ΝΑ ΦΟΡΤΙΣΤΕΙ Η ΜΠΑΤΑΡΙΑ ΤΟΥ ΚΑΙ ΝΑ ΓΙΝΕΙ Η ΣΥΝΔΕΣΗ ΤΟΥ ΜΕ ΤΟΝ ΥΠΟΛΟΓΙΣΤΗ. Η ΒΑΣΗ ΑΥΤΗ ΕΧΕΙ ΚΑΙ ΘΕΣΗ ΓΙΑ 6 ΜΠΑΤΑΡΙΕΣ ΑΑΑ ΓΙΑ ΝΑ ΜΠΟΡΟΥΜΕ ΝΑ ΦΟΡΤΙΖΟΥΜΕ ΜΕΣΩ ΑΥΤΩΝ ΤΗΝ ΜΠΑΤΑΡΙΑ ΤΟΥ ΡΟΛΟΓΙΟΥ GPS ΟΤΑΝ ΕΙΜΑΣΤΕ ΣΕ ΜΕΡΟΣ ΠΟΥ ΔΕΝ ΥΠΑΡΧΕΙ ΡΕΥΜΑ. - TO ΣΕΙΡΙΑΚΟ ΚΑΛΩΔΙΟ RS-232C ΓΙΑ ΤΗΝ ΕΠΙΚΟΙΝΩΝΙΑ ΤΗΣ ΒΑΣΗΣ INTERFACE ΜΕ ΤΟ COMPUTER. - ΤΟ ΤΡΟΦΟΔΟΤΙΚΟ ΠΟΥ ΜΠΑΙΝΕΙ ΣΤΗ ΠΡΙΖΑ ΚΑΙ ΣΤΗ ΒΑΣΗ INTERFACE ΓΙΑ ΤΗ ΦΟΡΤΙΣΗ ΤΗΣ ΜΠΑΤΑΡΙΑΣ ΙΟΝΤΩΝ ΛΙΘΙΟΥ ΤΟΥ ΡΟΛΟΓΙΟΥ. - ΤΟ CD-ROM ΜΕ ΠΡΟΓΡΑΜΜΑΤΑ ΓΙΑ ΤΟΝ ΥΠΟΛΟΓΙΣΤΗ. - ΒΙΒΛΙΟ ΜΕ ΠΟΛΥ ΑΝΑΛΥΤΙΚΕΣ ΟΔΗΓΙΕΣ ΧΡΗΣΗΣ. The new SATELLITE NAVI PAT2GP-1V uses the constellation of GPS satellites that ring the globe to tell you your current location. The watch employs a built-in rechargeable lithium-ion battery and high-density device mounting to create a new SATELLITE NAVI watch that is even more compact and lightweight than the original GPS first created by Casio last year. The PAT2GP-1V comes bundled with special PC linking software that lets you plot and manage GPS data from the watch on your personal computer. The PC link software allows the user to import and display raster map images (BMP or JPEG) on a computer. It also allows the user to plot a starting point, waypoints, and final destination on the computer screen, and transfer the route plan to the SATELLITE NAVI. The SATELLITE NAVI allows the user to monitor current position on the SATELLITE NAVI screen, using defined waypoints, and even keep track of the distance remaining to the destination and the current bearing. Track points of movements are stored automatically in SATELLITE NAVI memory, allowing the user to transfer the track points back to the computer and track the route on the screen and even store the information for future reference or route planning. All other product, service and company names mentioned herein may be the trademarks of their respective owners. CASIO’s own high-density device mounting technology makes it possible to mount more devices on a single circuit board. This in combination with the a rechargeable lithium ion battery power supply allows a new SATELLITE NAVI design that is more compact (40% less volume than the previous model) and lighter (50% lighter than the previous model). The rechargeable battery eliminates the need for battery replacements and makes it possible to provide 50-meter water resistance, which is enough to stand up to moisture encountered during outdoor wear. The new SATELLITE NAVI comes with a special attachment that makes it possible to connect a cable that links the watch to a computer for data exchange. The PC link software allows you to import and display raster map images (BMP or JPEG) on a computer, and then uses the map images to edit and define your waypoints and destination. You can also plot track points recorded by the watch on map and keep records of your movements on your computer’s hard disk. The new SATELLITE NAVI is the latest addition to the CASIO lineup of “Wrist Technology” products, which aim at creating a new market for wrist-worn devices that are highly portable and easy to use. CASIO is firmly committed to establishing and developing a personal navigation market as part of the general market for outdoor gear. The new SATELLITE NAVI has a 12-channel receiver that can receive signals from as many as 12 at least three GPS satellites to calculate and display the latitude and longitude of your current position. Positions are displayed in values indicating latitude (N or S degrees, minutes, seconds) and longitude (E or W degrees, minutes, seconds), which you can use to plot your location on a map. A simple operation changes the position information to Universal Transverse Mercator (UTM)*2 coordinates. The letters "GPS" stand for "Global Positioning System," a system of 27 artificial satellites and Earth base stations developed by the United States. The letters "UTM" stand for "Universal Transverse Mercator," which is a standardized coordinate system based on the metric system that divides the earth into 60 six-degree wide zones. Each zone is projected onto a Transverse Mercator projection and coordinate origins are located systematically. Almanac data received from satellites is stored in the watch's EEPROM. Almanac data is used in combination with the watch’s city code setting and the current time to predict which satellites are currently overhead, which makes it possible to produce readings in as quickly as 12 seconds. SATELLITE NAVI performs 3D measurement whenever it is able to access data from four or more satellites. In addition to latitude and longitude, 3D measurement also lets you see your current altitude. Past altitude measurements can be viewed on a graph that shows your changes in altitude over time. Precision for GPS altitude measurements may be less than that for position measurements. A choice of three GPS measurement modes provides flexibility to meet a variety of measurement needs. The One Shot mode takes a reading whenever you press a button, Auto Mode takes readings are a preset interval (selectable in the range of 10 seconds to 60 minutes), and the Continuous Mode takes readings every second. The plot screen shows your current location in relation to up to 10 waypoints you have registered in your route plan. You can zoom the plot screen to the scale that makes it possible for your current position and waypoints to appear on the same screen. In addition to your current position, you can also view track points that indicate your movement in relation to waypoints and your destination. The Graphical Navigation Screen graphically indicates the direction and distance to a destination (latitude and longitude) registered by you. This screen is great when hiking mountain climbing when you need to know the direction and distance you need to go to get to base camp a lodge, or other location. Data can also be displayed numerically, if you want. When you are using the continuous GPS measurement mode, the graphical navigation screen can also be used to display your heading, current speed, and maximum speed. Landmark Memory lets you store records for up to 200 locations you need to remember for instant recall when you want to incorporate them into a route plan. The watch comes preset with 100 landmark records that you can use or replace with your own data, if you want. Track Log Memory stores up to 400 track point records that show your location as you travel. You can recall these records when you want to trace your movements on the Plot Screen. You can specify a distance at which the watch beeps to let you know when you are approaching your destination. 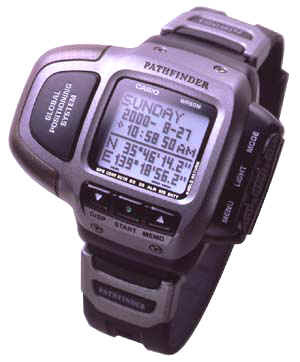 A special attachment that is bundled with SATELLITE NAVI makes it possible to connect a serial cable that links the watch to a computer for quick and easy data exchange. You can use the PC link software that comes bundled with the Watch to import and display raster map images (BMP or JPEG) on your computer. GPS data can be exported as a CSV or TXT format file for long term storage or porting to another application. Landmark Data: Landmark name, latitude and longitude, icons can be transferred between the watch and your computer. Route Plan Data: You can create and store route plans on your computer and transfer them to the watch as required. Track Point Data: You can transfer track point records (date, time, latitude, longitude) created by the watch to your computer for data management. The compact, water-resistant design of the new SATELLITE NAVI is made possible by a built-in rechargeable lithium ion battery. The watch comes with a charger attachment that you can use for recharging outdoors, using power supplied by six AAA-size batteries. A full charge provides enough power for approximately 140 one-shot mode measurements, 3.5 hours of auto mode measurements (with 1-minute interval), or 70 minutes of continuous mode measurements. Multi-windowing makes it possible to view different types of data on the same screen. For example, you could display the current time along with your current position, the direction pointer to your destination along with your current position, or any other of 17 possible combinations. Each time a successful position measurement is achieved, the watch uses time data included in the information is receives from the GPS satellites to automatically adjust the hour, minutes, and seconds of the Timekeeping Mode.